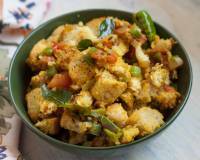 A classic South Indian breakfast, Vegetable Rava Upma Recipe is loaded with vegetables; a great way to start your mornings. 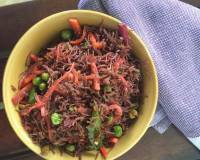 Serve it along with some chutney and coffee for a breakfast meal. 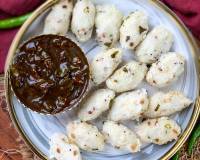 Vegetable Rava Upma is a traditional south Indian breakfast dish that is made from semolina and cooked along with vegetables and seasonings.This dish is popularly called as KharaBhath in Karnataka. At home we love to serve it along with a hot cup of freshly brewed filter coffee to make a complete breakfast and of course some fresh fruits on the side. 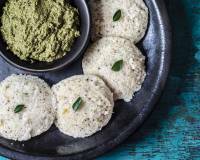 Serve Vegetable Rava Upma Recipe along with Coconut Chutney and South Indian Filter Coffee Recipe With Filter Coffee Powder for a complete south Indian Breakfast. 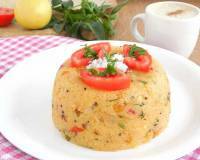 I add tomatoes to the Rava Upma as an alternative instead of vegetables to change the flavour. Tomatoes add a zing to the palate and tastes delicious too. 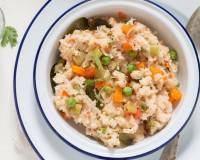 To begin making the Vegetable Rava Upma Recipe, firstly in a pressure cooker add the carrots and beans along with two tablespoons of water and pressure cook for 1 whistle. Turn off the flame and immediately release the pressure. Drain the excess water and set aside the carrot and beans. In a saucepan; boil 3 cups of water along with salt and a dash of sugar and set aside. Heat oil in heavy bottomed pan on medium heat; add mustard seeds, half urad dal seeds and allow it to crackle. 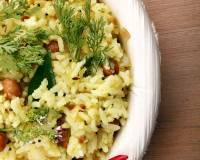 Stir in the onions, ginger, asafoetida, curry leaves and green chilles and sauté until onions are tender. Stir in the semolina and roast along with the onion mixture until you get the light roasted aroma and not letting it brown. Gradually pour the hot water into the above mixture and continue to stir in the process. Turn the heat to low, cover the pan and allow the Rava Upma to cook and steam in the heat. Keep stirring occasionally to avoid lumps. This will take about 10 minutes. Finally stir in the ghee, steamed vegetables and lemon juice and sauté for a couple of minutes on low heat until all the ingredients are well combined. 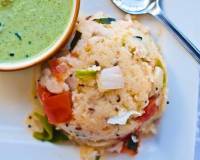 The ghee enhances the flavour of the Rava Upma. 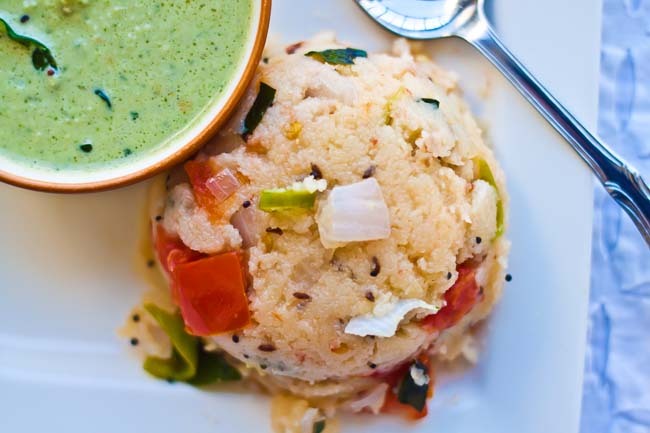 Serve the Vegetable Rava Upma hot with Coconut Chutney and Rava Kesari Bhath to make wholesome complete breakfast. Note: This is another tricky dish if you have not made it before; with experience and practice you will get the desired texture.